In the last post, we discussed the tradeoff of exposing personal data to garner more personalized user experiences. In Part 2, we will discover a model for the point of equilibrium: the intersection where user experience is the most optimized, given the amount of data the user is willing to make available. Those like myself with backgrounds in economics love a good chart (don’t we all? ), and will be familiar with the concept of equilibrium—the point where supply meets demand that dictates at what price and quantity a particular product will get sold. One could imagine a somewhat analogous model for the user experience vs. user cost—primarily regarding privacy, as other product-specific variables like latency or battery life factor into UX—as more personal data is made available to a company. Both will increase but follow different curves, and there is a point of equilibrium where they meet. That is, an optimal user experience given how much data someone is willing to expose. Beyond this point, someone will opt not to make any more data available, or even stop using a product entirely. Before this point, a better experience can be provided by collecting and utilizing more data. 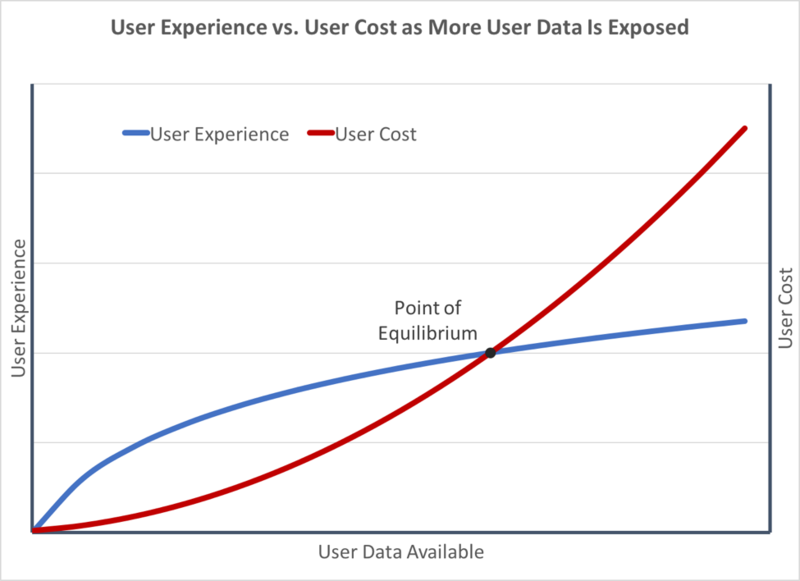 Since most companies want to provide the best experience and collect as much data as possible, they should aim to be at this point of equilibrium for each user. The user experience curve is convex. With a little bit of data about someone you can greatly improve their experience—for example high-level data on demographics and life stage for targeted marketing, or their email address so they can create an account and receive important information. Eventually there are diminishing returns to more data—the utility of a product or efficacy of a marketing campaign increases more with knowledge of the last ten vacations someone took than it does when you add the 11th through 20th. There could also be a point where the user experience slope increases again as you know everything about one aspect of someone, such as every trip they’ve ever taken, but for the most part this is not currently realistic. For those with backgrounds in finance, one could also imagine another model somewhat analogous to the efficient frontier in modern portfolio theory; the UX curve almost resembles the risk/reward achieved by diversification. The user cost curve is concave. There is little cost to someone of giving a company their basic information, but this can increase steeply—think access to their precise location all the time, or the entire contents of their email and text messages. It is usually worth it for users to give companies at least some data about themselves in exchange for personalization. As Exponential’s Director of Product Management, Tom Bash is responsible for leading product management, external go-to-market strategy and internal operations for Exponential’s engagement product suite. He is responsible for the ongoing development and success of Exponential’s video, mobile and platform products, including VDX and EDGE. Prior to this role, Tom led all mobile product initiatives at Exponential. Prior to his roles at the company, Tom was the first product manager at mobile location-based gaming startup Booyah, which included working on multiple top 10 App Store launches, and building a business intelligence platform on top of Hadoop. Before that, he was a consultant, conducting financial and economic analysis and market research for Fortune 500 companies. Tom holds a BA in Business Administration with a focus in Finance from the University of Washington. He is based in Exponential's headquarters in Emeryville, CA.